Ladies ultra comfort navy leather Sandals, UK size 6D (standard width). NEVER WORN . Leather uppers in navy blue with leather ankle strap and buckle fastening. Leather lined and thick cushioned leather footbed for comfort. Clarks K LEATHER Slingback shoes in good condition. Blue leather wedge heel sandals from Clarks Size 6 Buckle strap and elastic insert for comfort A comfortable, elegant pair of shoes. Clarks Ladies Dark Navy Peep Toe Sandals Size 8. Condition is Used. Dispatched with Royal Mail 2nd Class. Lovely comfortable Sandals, size 7, excellent condition worn once. Clarks Sandals Size 5.5. Dispatched with Royal Mail 2nd Class signed for. Priced to sell. Any questions please ask and thank you for looking. Blue Sparkly Clarkes Sandals Size 5.5. Condition is Used. Dispatched with Royal Mail 2nd Class. Clarks Ladies Un Dima Navy Leather Sandals Size UK 6 D. Lovely soft comfy sandals worn a few times Velcro fastening across foot and strap Dispatched with Royal Mail 2nd Class. Clarks Soft Cream Leather Cushioned Insoles. Clarks ‘White Foam Soles ’ - size UK 6. Royal Blue & Spotted GoldSoft Leather Sandals. Strong Flexible White Soles. The colour is a sort of pearlised very light blue with contrasting blue trim to sole and pretty flower decorated T-bar. Fastens with an ankle strap. These are lovely wedge sandals from the Softwear range. Still in good condition. New listingBeautiful Clarks Blue Suede Wedge Sandals Size 5.5D. Great Condition! Lovely Clarks Blue Suede Wedge Sandals. Size 3 from Clarks. Ladies turquoise blue flat sandals. Flip flop style slip ons. Size UK 6. Bought for my daughter and just too small - great for teenager for School or adult. Usual great quality by Clarks. Ladies Clarks Blue Tacent Rose Flat Sandals Size 5. Condition is Used. Dispatched with Royal Mail 2nd Class. Quality genuine leather sandals in excellent condition, only been worn a few times. I try to be honest as possible in all my listings. Please ask any questions prior to bidding. I will combine postage please ask for a price. I will only refund if there is an error in my listing. If you are unhappy with your purchase please contact me before leaving a negative comment. I will always try to resolve it. 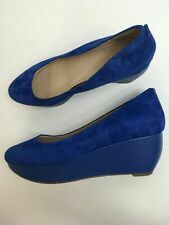 Ladies Blue Suede Clarks Cork Wedge Mid Heel Sandlas/Slingbacks Size 6. Condition is Used. Dispatched with eBay delivery – Shutl 2-3 days. Clarks Raffi Star Ladies Sandals Blue Leather Size 6 New With Box! Clarks Raffi Star Ladies Sandals Blue Leather Size 6 New With Box!. Condition is New with box. Dispatched with Royal Mail 2nd Class. Selling for my mother, another 2 pairs the same but different colours also for sale. New with box, unworn. They look nice! What more can I say...? Hope the pics do them justice. Thanks. LADIES "CLARKS SPRINGERS" SANDALS, SIZE 4 BLUE SUEDE, VGC. Condition is Used but very good as not had much wear at all Dispatched with Hermes Tracked. 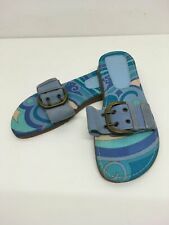 New listingCLARKS 7 flat comfort sandals; blue leather; adjustable; worn twice; vgc! Pair of blue comfort sandals by CLARKS size 7 - excellent condition with hardly any signs of wear! Clarks BNIB Ladies Wedge Sandals Rusty Free Sky Blue Leather UK 6.5. Condition is New with box. Dispatched with Royal Mail 2nd Class Signed For. Clarks Ladies blue Leather Sandals. Very comfortable. K CLARKS DARK BLUE SANDALS. Made by K Clarks. Size 5 uk Extra Wide Fit. Dark blue leather uppers. Velcro strap fastening, quite adjustable. Clarks Blue Nubuck Active Air Open Toe Sandals 7/40. Excellent Condition Very Comfortable.Adjustable Velcro Fastening at Ankle.. Dispatched with Royal Mail 2nd Class. Lovely sandals from Clarks in good condition, hardly worn. CLARKS Narrative . Stunning Blue Nubuck Leather Sandals with 2.5" White Block Heels. UK Size 8 D regular Width. Clarks blue suede feel velcro sandals. Never worn just tried on. Really good quality sandals from Clarks in blue leather with diamante detail for design. They have only been worn twice so in good condition in Size UK 4 Eur 37 with original box. Clarks duckegg blue romantic moon sandles size 5 . These shoes have been warn once. They are like new. CLARKS LADIES CASUAL TEAL LEATHER SHOES SANDALS WEDGE HEEL SIZE 5.5 D VGC !